Please check with the manufacturer concerning the availability of this featured model. And make sure you mention you read about it on JSS Software while you're at it. As the sales brochure proclaimed: "Presenting the very special, 75th Anniversary, Diamond Jubilee Edition Continental Mark V. This is a very special automobile, an automobile that is, frankly, an indulgence in every best sense of the word. This is the Diamond Jubilee Edition Mark V. It is a unique model and it represents the most luxurious production automobile Lincoln ever built." Ford Motor Company celebrated its 75th year in the automobile business in 1978. To commemorate this milepost in automotive history, Ford produced two very special automobiles as limited editions. 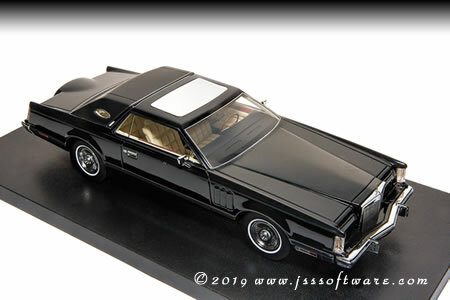 The 1978 Continental Mark V Diamond Jubilee Edition was one; the 1978 Ford Thunderbird Diamond Jubilee Edition was the other. The Mark V version truly was limited with production of just 5,159 cars. To set it apart from the ordinary Marks, the Diamond Jubilee was available in just two colors: Diamond Blue and Jubilee Gold. Whichever color you chose, it would be repeated throughout the car. In addition to the special Clearcoat paint, the padded Landau vinyl roof featured color-keyed moldings and integral Coach Lamps. The vinyl-insert bodyside moldings, vertical bars on the grille, bumper guards and rub strips, four turbine-style cast aluminum wheels, grille ornament, and padded vinyl deck lid kickup with matching vinyl-insert lock cover were all coordinated. There were 2,602 in Diamond Blue and only 1,511 with the optional moon-roof like this one. Automodello captured the essence of this luxurious automobile in profound detail. I personally found the Diamond Blue replica to be a stunning rendition of the Lincoln 75th Anniversary Edition. As I fondled these exquisite replicas I was impressed by the attention to detail which was obvious on each and every one of them. First off, to me, a model has to look right to my eye, is the model scaled correctly, does it look off or is it pleasing to the eye. All three of these models easily passed the eye test, they just look right to scale. Next up is how was the paint? Paint looked good very smooth and pleasing with no flaws and the color was spot on. Finally how was the fit and finish? Again they passed the test; all chrome was tight to the body and scaled to perfection. Inside, the interiors of the Diamond Jubilee Edition Mark V's were the most luxurious ever installed to date by Lincoln in a production car. Also matching the exterior color scheme, the interior featured front bucket seats with a padded center console. The console provided extra storage, and came equipped with an umbrella built into the underside of the padded armrest. The seats were upholstered in luxury cloth with a unique sew style, and had broad lace inserts as distinctive reminders that this was NOT your ordinary Mark V! Once again Automodello replicated the Lincoln Mark V Golden Jubilee interior precisely to factory specs. Remember the Automodello line are static models which simply means no working features such as opening doors, hood or trunk lid therefore to admire the interior design you are regulated to viewing it through the windows. However, the Automodello replica has windows up on the passenger side whereas the window is down on the driver’s side, allowing you to admire the interior more clearly. 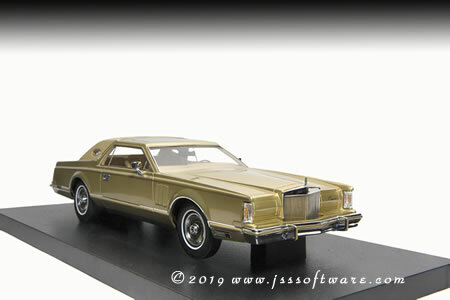 Bottom line the Automodello 1978 Lincoln Mark V Golden Jubilee is worth your consideration if your collection consists of luxury automobiles. I am always asked which replica "Rang my bell?" And to that question I would say "I love the Diamond Blue", however, that is just my color preference, truth be told you can't go wrong regardless of which one "Floats your boat"; they all display nicely and will be a welcomed addition to any collection.